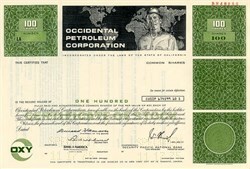 Beautiful engraved RARE specimen certificate from the Occidental Petroleum Corporation dated in 1975. This historic document was printed by Security-Columbian Banknote Company and has an ornate border around it with a vignette of an oil worker in front of a world map. This item has the printed signatures of the Company's President, Armand Hammer and Secretary and is over 34 years old. Armand Hammer (May 21, 1898 � December 10, 1990) was an American industrialist and art collector. Hammer was CEO of the Occidental Petroleum Company, an oil and natural gas exploration and development company. Hammer was born in Manhattan, New York and attended Columbia College and then medical school at Columbia University as a young man; he received his medical license in 1924 and, though he never practiced medicine, he relished being referred to as "Dr. Hammer." Instead, after graduating from medical school, Hammer extended earlier entrepreneurial ventures with a successful business importing many goods from and exporting pharmaceuticals to the newly-formed Soviet Union. He moved to the USSR in the 1920s to oversee these operations, especially his large business manufacturing and exporting inexpensive pencils. After returning to the US, he entered into a diverse array of business, art, cultural, and humanitarian endeavors, including investing in various U.S. oil production efforts. These oil investments were later parlayed into control of Occidental Petroleum. Throughout his life he continued personal and business dealings with the Soviet Union, despite Cold War taboos against such dealings by Americans. In later years he lobbied and traveled extensively at great personal expense, working for peace between the United States and the Communist countries of the world, including ferrying physicians and supplies into the Soviet Union to help Chernobyl survivors. Politically, Hammer was a staunch supporter of the Republican party. He boosted Richard Nixon's presidential campaign with tens of thousands of dollars in campaign contributions. He was convicted on charges that one of these donations had been made illegally, but was later pardoned by Republican U.S. President George H. W. Bush. Simultaneously, the Hammers' name was widely used in propaganda by the Soviets. The contradiction between Hammer's open sympathy for the Soviet Union and his success as a capitalist, as well as his involvement in international affairs and politics, have made Hammer a subject of suspicion and conspiracy theory for many; further, his close relationship with former Democratic Tennessee Senator Albert Gore, Sr., despite Hammer's own party affiliations, has been the subject of especially broad scrutiny and speculation. Hammer was also an avid collector of Impressionist and Post-Impressionist paintings. His personal donation forms the core of the permanent collection of the UCLA Hammer Museum in Los Angeles, California. Despite popular myth, the relation between Hammer's name and the household product Arm and Hammer baking soda is coincidental. The pun was not lost on Hammer, though: during the 1980s, he attempted to buy Church and Dwight, makers of the Arm and Hammer line of products; he succeeded in buying a sizable minority interest and eventually sat on its board of directors. Hammer was a philanthropist, supporting causes related to education, medicine, and the arts. Among his legacies is the Armand Hammer United World College of the American West (now generally called the UWC-USA, part of the United World Colleges). He embraced a kind of Victorian view of world affairs, in which personal relationships could overcome geopolitical tensions. Through the mid-1980s, he tried to make his own life a model of this, and bragged that he was the only man to have known both Vladimir Lenin and Ronald Reagan. His generosity and diplomacy were recognized around the world, and by the time he died, Hammer had won the Soviet Union's Lenin Order of Friendship Among the Peoples, the U.S. National Arts Medal, France's Legion of Honor, Italy's Grand Order of Merit, Sweden's Royal Order of the Polar Star, Austria's Knight Commander's Cross, Pakistan's Hilal-i-Quaid-Azam Peace Award, Israel's Leadership Award, Venezuela's Order of Andres Bello, Mexico's National Recognition Award, Bulgaria's Jubilee Medal, and Belgium's Order of the Crown. Hammer hungered for a Nobel Peace Prize, and was nominated for one in 1988 for his outreach to end the Cold War, but the award went to Tenzin Gyatso (the 14th Dalai Lama). He also appeared on The Cosby Show, saying that a cure for cancer was imminent. His confidence was not justified, as he died of bone marrow cancer in December 1990. He was 92 years old.